3M™ 9960 Diagnostic Microfluidic Hydrophilic Film is part of the product line of similar materials referred to as 3M Device Component Films for Medical Device Components. This product line includes 3M 9984 Diagnostic Microfluidic Surfactant, Free Fluid Transport Film and 3M 9962 Diagnostic Microfluidic Hydrophilic Film. 3M 9960 Diagnostic Microfluidic Hydrophilic Film was selected for testing compatibility with laser processing. It consists of a 173µm thick, optically clear polyester film treated with a 3M hydrophilic technology coating, a layer less than 1µm thick on both sides. 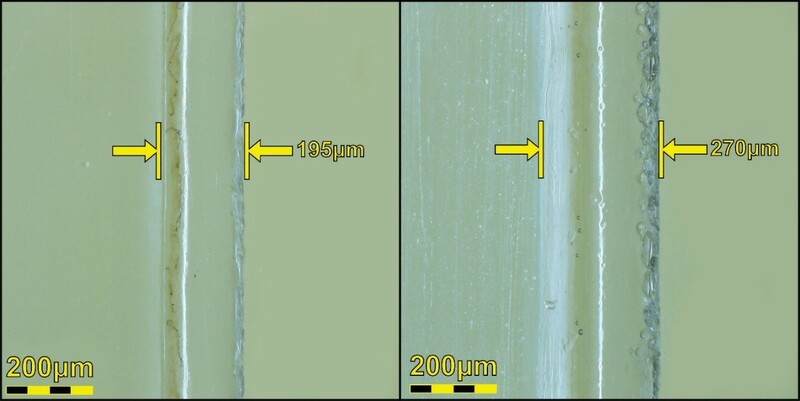 A diagram depicting the layers of the 3M 9960 film is shown in Figure 1.
on both sides of the polyester film (173µm). 3M 9960 Diagnostic Microfluidic Hydrophilic Film is an optically clear, chemically inert, dimensionally stable film that is qualified for use in the health care field. 3M 9960 is used for bonding, laminating and assembly of in-vitro diagnostic and related membrane-based immunoassay products. The non-contact nature of laser processing allows applications to be processed with small features and fine geometry that might be difficult to achieve with traditional mechanical methods. 3M 9960 is only suitable for laser cutting that produces smooth edges and minimal heat-affected zones, without degrading the physical properties of the material. Other laser processes are not recommended, as they are not conducive to the intended use of this material. Universal Laser Systems makes it simple to consistently and repeatedly process this material to a high degree of dimensional accuracy, as the non-contact nature of laser cutting greatly reduces irregularities during processing. 3M 9960 Diagnostic Microfluidic Hydrophilic Film was tested to assess laser processing compatibility and to determine the best configuration of laser power and wavelength. The 3M 9960 Diagnostic Microfluidic Hydrophilic Film absorbs 9.3µm energy more efficiently than other laser wavelengths available from Universal Laser Systems, meaning less peak power was necessary to produce good results with minimal heat affects. 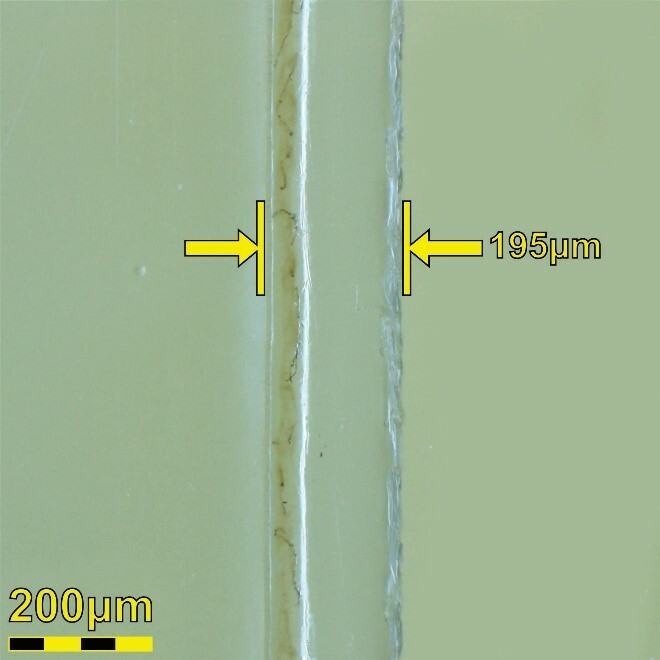 With the configuration of 75 watts of 9.3µm laser energy, laser cutting of 3M 9960 Diagnostic Microfluidic Hydrophilic Film produces a consistent edge along the processed path. Laser cutting of 3M 9960 film produces a small amount of debris that adheres to the edge, requiring some cleaning by wiping the edge with a solvent such as isopropyl alcohol. A microscopy image taken at 300x magnification of the edge after laser cutting 9960 is shown in Figure 2. 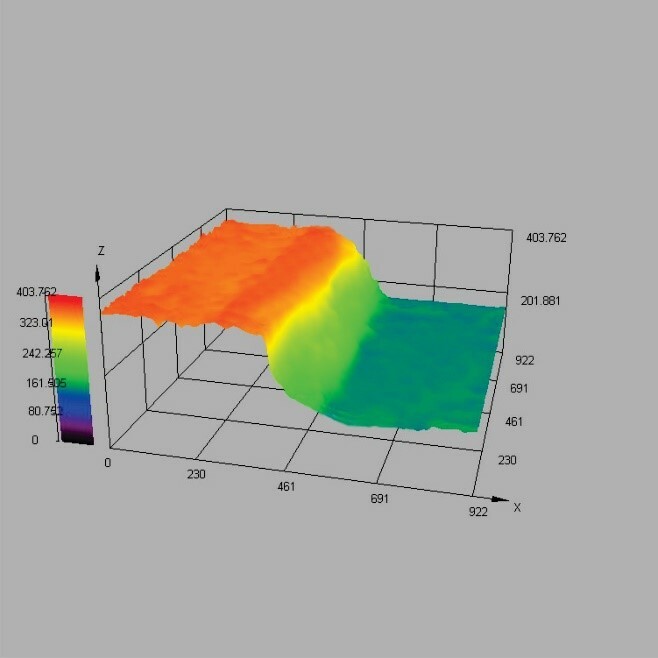 The 3D image in Figure 3 depicts how the polyester film reacts to the laser energy by forming a “wave” of melted material along the top surface of the edge (dark orange area). Figure 2. Microscopy image (300x) of the edge after laser cutting 3M 9960 film. The heat-affected zone measures to 195µm. Figure 3. 3D Microscopy image (300x) of the edge of 3M 9960 film. 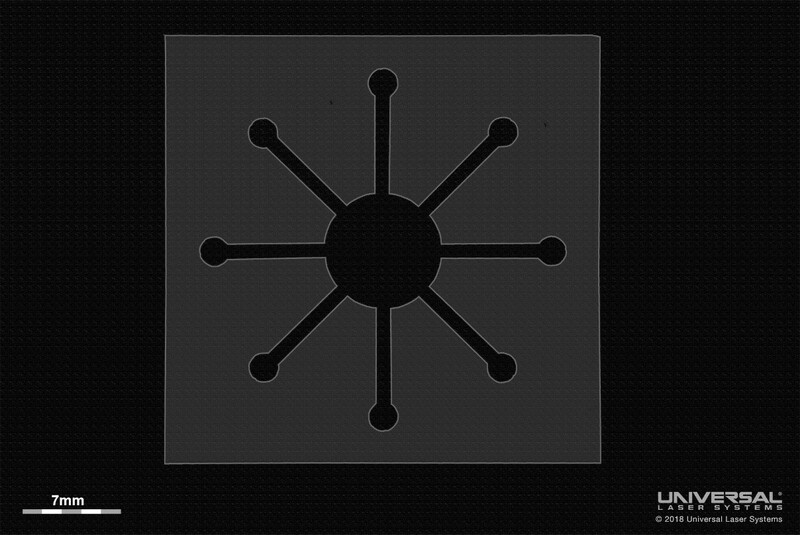 For comparison, 3M 9960 Diagnostic Microfluidic Hydrophilic Film was also tested with an alternate system configuration of 10.6µm laser energy at equivalent laser power level. The results of these tests were compared by analyzing the heat effects, edge quality, and post-processing requirements. The results of the comparison of these system configurations are listed in tabular form in Table 1 and shown photographically in Figure 4. Both system configurations appear viable with some reduction in quality of the results for the 10.6µm configuration as stated in the comparison. Figure 4. Comparison microscopy images (300x) of the edge resulting from 9.3µm (left) and 10.6µm (right) wavelengths. 3M 9960 Diagnostic Microfluidic Hydrophilic Film applications requiring fine geometry and intricate detail, without degrading the physical properties of the material, can be accomplished with technology from Universal Laser Systems. An example demonstrating the results of laser cutting 3M 9960 film is shown in Figure 5. Figure 5. Example of the fine geometry possible with laser cutting of 3M 9960 film. 3M 9960 Diagnostic Microfluidic Hydrophilic Film is suitable for laser processing and was extensively tested to determine the optimal processing configuration. Through this testing it was determined that laser cutting is a viable process and a 75 watt 10.6µm or 9.3µm CO2 laser source is the best configuration for the processing of this material. The polyester substrate efficiently absorbs the 10.6µm or 9.3µm wavelength laser energy to produce a clean smooth edge that has minimal heat-affected zone and discoloration.